It is summertime. All of the farmer’s markets are in full swing. They have fresh tomatoes, cucumbers, zucchini, squash, peaches, and so much more. You, of course, purchase too much fresh produce and then realize that it will go bad prior to you being able to eat it. This is not good. You have tried freezing the vegetables, but the results are poor. Canning is a good option but is time-consuming, plus once the can is open, you have to use all of the produce at one time. Luckily, we are going to help you find the best food dehydrator to save you time and money. A food dehydrator is not just for our fruits and vegetables. We can also dehydrate meats and other foods as well. The food will last longer and can be eaten at any time. Just imagine being able to make your own trail mix with berries that would have gone bad. You can now top your salad with homemade dried cranberries. Now instead of unhealthy potato chips, you can make your family homemade chips or my personal favorite banana chips. This is a much easier way to get your family to eat healthily and save yourself time and money. Seems like a win-win kind of situation. There are numerous other benefits that a food dehydrator can bring to you and your family. Continue reading to learn more about the top 8 food dehydrators on the market. I have covered the affordable to mid-priced to the high-end versions and discovered top contenders in each category. Go on; you know you want to see which one you would like best. This is the number 1 bestselling food dehydrator for a reason. It is small, yet powerful. Just like more expensive models, this one dehydrates at a temperature of 165°F does too which means less chance of having mold and other disgusting things inside of your food dehydrator. That makes it safer for you and your family and at a more economical price. 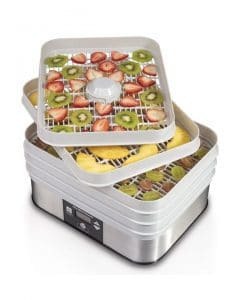 • It has four trays which is a rarity in affordable dehydrators. • You can see right through the dehydrator so you know how your food is doing. • Operates at 165°F the perfect temperature for a dehydrator. This will fit perfectly in your kitchen whether a small studio or a large family home. It includes a recipe book, two different solid sheets along with two different mesh sheets, and even three different jerky spice packets. That is great for the jerky enthusiast in all of us! At 600 watts it is stronger than some other food dehydrators on the market. I like how it has a top mounted fan and is in a unique shape. Sure to fit in your kitchen and will also fit in with a classic or modern décor. It is easy to see how this is one of the best-rated food dehydrators on the market. • This dehydrator has an adjustable thermostat that ranges from 95 to 160°F. • Has a top mounted fan. • Foods and flavors never mix therefore there is no reason to rotate the trays. This is a pricier model. It does not necessarily make it better, but it does have some features that the others do not. It is a high-quality unit and made in the USA. This dehydrator has 9 trays and 15 square feet for drying space. This model may be too big for some people’s kitchen. There is an on and off switch that is built in. The model is 110V and 600 Watts. Most other models have been around 500 Watts if that tells you about the power of this dehydrator compared to the other models. The thermostat is adjustable which is always great and ranges from 105 to 165 which is warmer than most of the food dehydrators. The poly screen tray inserts are very easy to clean. The fan for this dehydrator is in the rear, which seems pretty common for the larger version of dehydrators. Excalibur has patented the hyper-wave fluctuation technology which allows the food to dry faster, safer, and better than the competition. Plus, according to Excalibur, other dehydrators trap moisture inside which creates mold and bacteria and even yeast. You do not need to worry about that with an Excalibur model. Right, there is probably what makes it more costly than the other brands, but then again it makes it safer for your family to eat what comes out of it. In order to prevent it, the machine fluctuates its temperature inside. They say that when the temperature is higher (and this one is higher than most others) that the moisture inside evaporates and then the temperature can go down again. It looks as though this machine adjusts its own temperature. This is more than just a food dehydrator. You can dry your arts and crafts in it and make your dog their own healthy and preservative-free snacks. What I like most about this one other than the whole mold thing is that you can raise dough in it for delicious homemade bread. What more could you want? 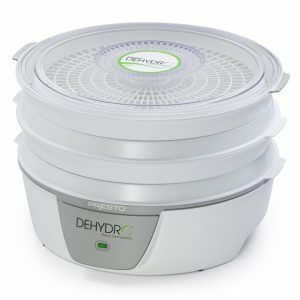 For those with a larger family, this is certainly one of the best food dehydrators you can purchase on the market today. The Excalibur 3926TB is top notch and is quite similar to the other Excalibur model already discussed. Same amount of trays and drying space along with the varying temperature and Parallax Horizontal Airflow. That is what makes Excalibur a cut above the rest. Plus, if you are looking for a kitchen appliance made in the USA, look no further. If price and space are not concerns, this is the top pick. You can make dried fruit slices like papaya, mango, and banana chips amongst other things. If you have a herb garden, you can dry your own herbs, so you no longer have to purchase them at the store. If you enjoy camping or long hiking trips, you can make your own jerky, so you do not have to purchase the highly salted jerky at the store. When looking at dehydrators, it is important to notice that it has a fan. This particular one has it in the common area at the rear of the dehydrator. This will allow the food to dehydrate properly and not overheat. Plus, with an adjustable thermostat, your food will dry at the correct temperature. I like this dehydrator since it has six shelves, or drying racks, to lay your food out on. With some dehydrators having numerous drying racks, and others having only a few, it is nice to see that this dehydrator has just the right amount. Plus, if there are too many shelves the appliance may not be able to fit comfortably on your kitchen counter. A solid sheet to make fruit snacks and it even prevents overheating protection. Follows the guidelines of the US Electrical Safety Regulations ETL. With all of these benefits, it is easy to see how great of a dehydrator this appliance actually is. My personal favorite part is the size. It is not too big, but also not too small. It is just right for your average sized kitchen. 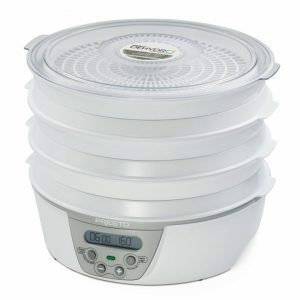 If you do have a more petite sized kitchen, I would maybe recommend a smaller version of this dehydrator. Keep reading to see which one that may be! This is a more compact sized dehydrator, but it stacks pretty high with 6 shelves to create tasty snacks and other dried foods. 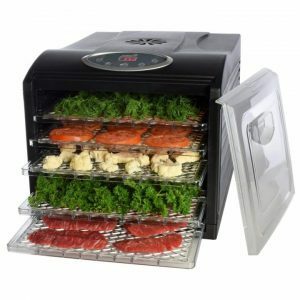 This is a great food dehydrator since it can make jerky out of poultry, different meats, and even seafood. Can other dehydrators do that? The best part is the free packet of jerky seasoning so you can make a unique jerky that other dehydrators cannot. This dehydrators digital thermostat ranges from 90 to 165 F. It is also has a capable timer on it so you can walk away and know that your food is set at the right time. You will not have to remember what time you put it in at; the dehydrator will just tell you when it is done. What makes this dehydrator a little different from the previous is the fact that its fan is located on the bottom of the dehydrator. This pushes the air up rather than over. This is not necessarily a benefit nor is it something that is bad. It is just unique to this machine. Plus, you do not need to rotate your trays, everything will cook evenly which is all that matters in the end. Now, what all does this include? Everything is dishwasher safe which is always great for clean-up. This particular model will fit easily into any kitchen. It is just the right size for that tiny kitchenette in your first apartment, or it can fit in the average family’s home kitchen. Can also easily be hidden for when the company is over enjoying their preservative-free snacks! For those with a busy family, this is your food dehydrator. The food is ready in a matter of hours and not days. That means you can have your special venison jerky and dried apricots ready in hours, and you no longer have to plan your hiking trips a week in advance to make sure that your food will be ready on time. What makes this dehydrator different from the other models? The fan is mounted on the top rather than the bottom or the back of the dehydrator. This particular model has five trays and a jerky gun. Not the most drying sheets, but you do not need a lot since it dries your food in hours and not days. Plus, they also provide a clean a screen for your messy foods and even a recipe guide. Each of these dehydrators has something that makes them unique. The technology of this particular brand of food dehydrators has been around for over 30 years. They believe that converge air flow system provides even drying starting at the top and continuing to the bottom of the dehydrator. Just like with other dehydrators, you do not need to rotate the drying sheets which is always great. I would recommend this dehydrator for those who are active in making jerky. That is what this particular model was designed for. With special recipes and rubs and even a jerky gun, you cannot go wrong with this dehydrator. Making your jerky in a matter of hours rather than days means that you can plan a hike one day and have the food ready for it the next. This is your dehydrator. This is a more compact and affordable food dehydrator. You can continue to make your healthy snacks without extra sugars or preservatives in them. Always a bonus for when you want to keep your family healthy and happy. You can make your own dried fruits, meat jerkies, and even dried vegetables. Since it is a smaller model, it has five trays which are more than adequate for smaller families and couples. Along with the five drying trays, you also have a fine mesh sheet that was built for drying your herbs and a solid sheet so you can make your kids (and you) delicious fruit rolls. I know they are my favorite part of the food dehydrator! Hamilton Beach is a very well-known brand in the kitchen appliance industry, so you know you are getting a really good dehydrator for your money. This dehydrator has 500 watts of power which is the average wattage of the kitchen appliance. 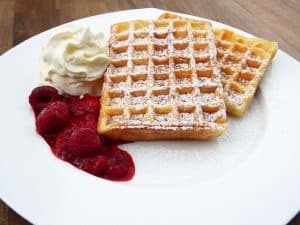 As with the others, it has airflow that is continuous, so you do not need to revolve the trays and everything will dry evenly. That means less work for you. For those busy people out there, this food dehydrator will automatically shut off after the timer goes off. That means you can do what you need to do while it is doing its job. You no longer have to babysit the food dehydrator all day and remember what time you put the food and herbs in. The timer does that job for you, so long as you remember to set it. It will also fit into any size kitchen, even your first studio apartment that barely has a kitchen in it! Does the temperature vary, or is it stable? You will want to find one that varies and can go up to 160° F and then go down to around 100° F to protect your food from bacteria. Most of the dehydrators are able to do this, but you should make sure. Try to find one with an adjustable thermostat or where the temperature can be set by the type of food that is in the dehydrator. Some will be able to adjust their thermostat by what food is inside. The more expensive the dehydrator, the more options you will have for dehydrating your food. Best to research your options. I would have to say an Excalibur is best for the thermostat and varying the temperature. There is no point in purchasing a food dehydrator if you are not able to store it or keep it on your kitchen counter. Look at the dimensions first and then decide. If you have a small kitchen, I would not recommend you purchase an Excalibur model. I would recommend either a Presto or Nesco. They are smaller in size and can be stowed away pretty easily in a cabinet or drawer if you need more counter space. They provide enough drying racks to dehydrate food for a few people for when you go hiking and camping. Your herbs will also work well in a smaller dehydrator. Plus, you will be saving lots of money in the long run since you will be purchasing a moderately priced dehydrator and drying the right amount of food for one or two people. If you do not have the time to babysit your food, or you are not good at remembering when you put the food it, it will be quite beneficial for you and your family to purchase one with a timer. Also, when the timer goes off, the dehydrator turns off, so you do not need to worry about overheating or overcooking. As someone who cooks a lot and bakes a lot, I can tell you from first-hand experience how difficult it is to dehydrate anything without a timer. I can never remember when I put it in and can never remember when to take it out. With timers, you just set it and then it automatically shuts off. You can go to bed knowing that it will be done in the morning. It is difficult to pick just one of the top 8 food dehydrators to purchase. That is why I have come up with three different models or brands. For a more expensive food dehydrator, I highly recommend anything by Excalibur 3926B. The food dehydrators are quite large but think about all of the food you can fit in them at one time. No more having to check on your food either since it has a timer and an amazing thermostat that will keep mold, yeast, and mildew away from your food. Always trust an appliance that has Parallax Horizontal Airflow technology. It will not let you down. My second favorite is the top-selling Presto 06300. It is affordable and works great. It goes up to 165 so you can be sure that it will not grow mildew and mold, unlike its competitors. Plus it is small and can fit anywhere in your kitchen. You can even store it out of sight when guests come over. 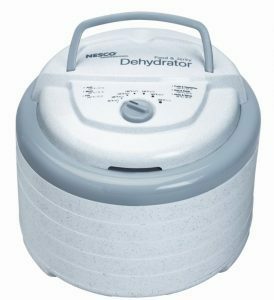 My third pick is the Nesco Snack Master Pro Food Dehydrator FD 75A. This one was designed for the jerky lover in us all. Spice packets and everything. There you go, all you need to know about the top 8 food dehydrators. Get yours today!